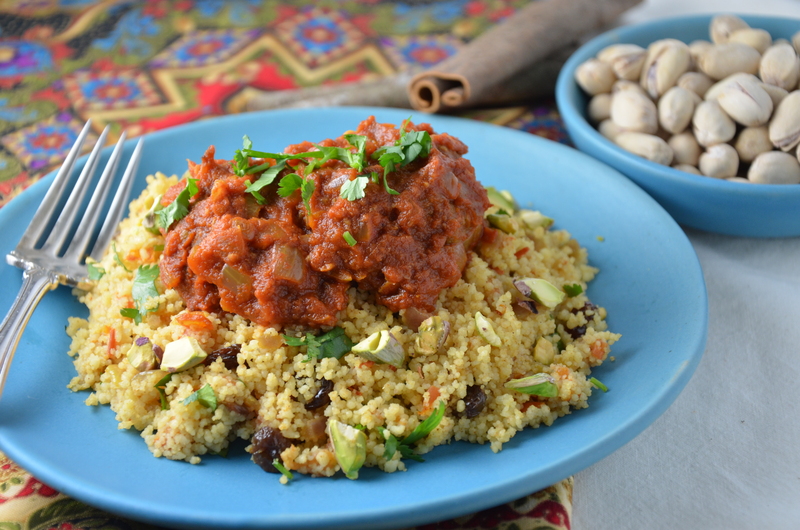 A Moroccan take on a classic Italian pairing or vice versa? I wonder who invented it first? Well, when I look around the world at various cuisines, I notice many variations on meatballs in tomato sauce, or some kind of sauce and honestly, who cares who did it first? It’s just delicious. 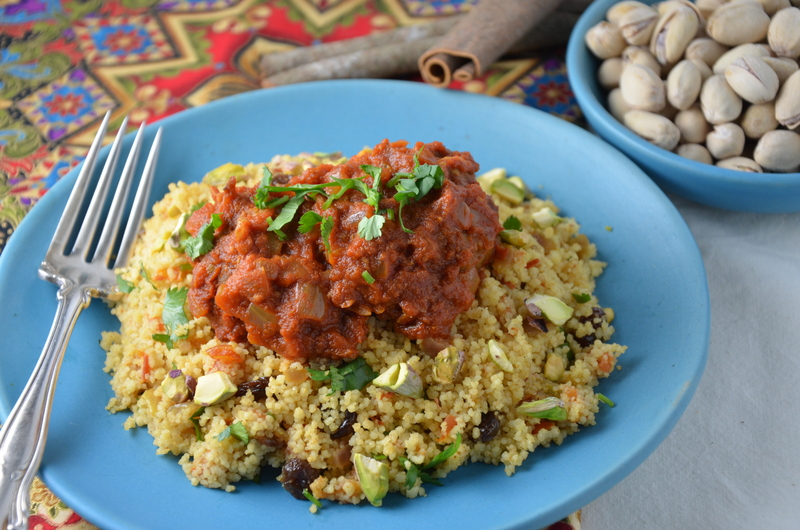 When I make this dish I always serve it with my Spiced Couscous Pilaf recipe and (profuse apologies to my Italian friends), it’s just so much more exotic than meatballs and spaghetti; lighter too. Couscous is fluffy and not as filling as spaghetti and it doesn’t allow the tomato sauce to fall to the bottom of the bowl the way that spaghetti does (a pet peeve of mine). So on both counts, I prefer the Moroccan version to the Italian one. I urge you to check it out for yourself. This recipe is adapted from Bonnie Stern’s Simply HeartSmart Cooking. I really hope that you enjoy it! Place all ingredients for meatballs in a medium mixing bowl and combine. Shape into small balls. Place meatballs on a parchment lined baking sheet and bake for 20 minutes until browned and cooked almost through. Heat olive oil in a large skillet. Add onion and sauté until soft. Add garlic and spices and sauté until fragrant. Add pureed tomatoes. Bring to a boil. Reduce heat and simmer gently for 30 minutes. If the mixture becomes too thick, add a bit of water to thin it out. Add the meatballs and simmer gently until the meatballs are cooked through. As with any sauce-based recipes, the flavour improves if allowed to sit overnight in the fridge. Serve with Spiced Couscous Pilaf with Raisins and Pistachios. Looks delicious! Can we grind the chickpeas into a paste instead of chopping them? thanks so much for this recipe! I have never tried that, but I’m sure it would be really good. It would just be a different texture compared to when you chop them. Let me know if you try it and how it turns out! I really would like to shake the hand of the person who invented meatballs… It did an excellent work! you dish looks great… it’s mouth watering! Yes! I would like to shake their hand too! I’m so glad you think it looks mouth-watering. Thanks so much for taking the time to make a comment; I really appreciate it. I have made these meatballs and they are fabulous!!! Thanks so much. 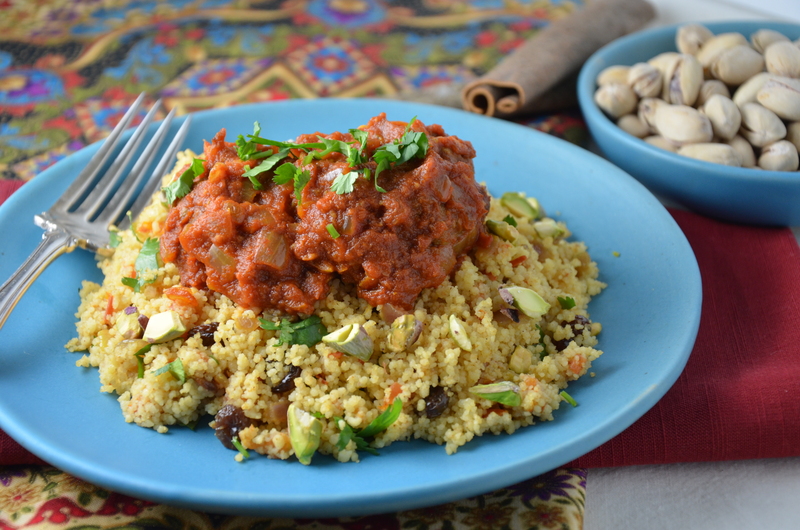 I really appreciate your comment because you know a lot about Moroccan food! Hope you have a wonderful week. next time i plan to make them with your couscous too! Excellent – let me know how you like it! Yum! That looks healthy and delish! Thanks so much! I really appreciate that you took the time to comment! I hope yo have a lovely weekend! That sounds delightful! I always have a soft spot for Moroccan style food, thanks to a good neighbourhood restaurant where we lived many years ago. Thanks for the recipe. You’re more than welcome! I too have a very soft spot for this lovely cuisine! I wish there were more Moroccan restaurants near me too! Thanks so much for taking the time to stop by my blog – I appreciate it! Thanks for introducing me to Moroccan food. Chickpeas and cumin are favourite ingredients of mine. I have bookmarked and will try them. Lovely weekend to you!